Northern China is a massive region with tremendous variations in climate and weather. Spanning areas like Inner Mongolia, Beijing, and Harbin, this region has temperatures throughout that range from sub-zero during the winter months to sweltering and humid during the summer. While it's hard to make generalizations about such a large area, the climate is generally continental, experiencing dry, freezing winters and summers that are warm with lots of rain. During the winter months, this area is influenced by cold air from nearby Siberia, while the summer is monsoon season. Outside of the summer months, northeast China is mostly dry. The region is typically very sunny, experience on average 2,500 hours of sunshine each year. Harbin isn't known as the "Ice City" without reason. Harbin has long, freezing winters and brief summers. It's not uncommon for there to be snow on the ground for nearly half the year. Temperatures in Harbin in January can drop as low as -35 degrees Fahrenheit (-37 degrees Celsius), while summertime temperatures rarely exceed 70 degrees Fahrenheit (21 degrees Celsius). Shenyang's climate is influenced by China's monsoon season, with hot and humid summers and cold and dry winters. The city experiences four distinct seasons, with extremely varying temperatures ranging from an average of 12 degrees Fahrenheit (-11 degrees Celsius) in January to 76 degrees Fahrenheit (24 degrees Celsius) in July. Most rainfall occurs in July and August. The Inner Mongolia Autonomous Region is a large area in northern China with a diverse climate. Winter has many blizzards and is quite cold, while summer is hot and short. The climate is largely arid to the eastern part of the region, getting more humid to the east and south. There is a huge variation between daytime and nighttime temperatures, so travelers should be prepared. Beijing's climate is slightly different than much of northern China. One of the country's most populous cities, Beijing experiences a humid continental climate that's strongly influenced by the monsoon. During spring, the city can experience occasional sandstorms from the Gobi Desert but is mostly dry. Most of the rain falls from June through August. In Northern China, the winter is long and cold, lasting from late November, all the way through March. Temperatures are often below zero, and you'll likely see plenty of snow, especially if you visit the far north. There are plenty of winter activities in the north such as the Harbin Ice & Snow Festival and lots of skiing. What to pack: It is quite a dry winter, and your skin will feel extremely dry and tight. You can bring your layers from home, but if you don't want to pack so much, you'll be able to buy plenty of winter gear in Beijing's markets (that goes for any city you're visiting). The Chinese wear long underwear in the winter along with lots of layers so you'll be able to find everything you might need. 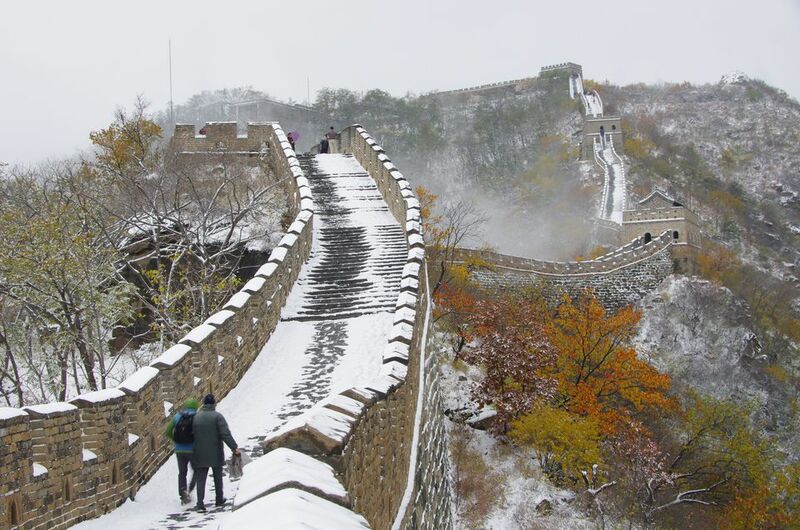 And you will need it if you're planning to hike along the Great Wall in January! Summer sees the opposite extreme in temperatures. Don't think that because it has cold winters, the northern part of China has cool summers. Unfortunately, that's not the case. It can be scorching and very humid during the summer months. Summer lasts from May through the end of August, but it can still be warm through September. What to pack: Pack like you would for any hot and humid summer climate—think light, breathable fabrics (try to avoid polyester, for example) that will wick away moisture. It's essential to wear appropriate clothes and keep hydrated, especially while sightseeing under the sun. Especially in Beijing, sightseeing activities can offer little shade, so it's important to be careful and bring plenty of sunscreen. Spring is a good time for travel because the climate is much milder than in winter and summer. While it's true that spring can be rainy, you won't find the extreme temperatures, and therefore sightseeing can be much more enjoyable. In the far reaches of Northern China, you might still experience snowy conditions, but cities with more humid climates, like Beijing, will generally be pleasantly warm. Fall is a favorite time to travel in China. The weather is usually pretty glorious and in the north, you have a number of opportunities to see fall foliage. China celebrates National Day in the early part of October, and you might want to avoid that. Domestic travel is hectic during that October break, and prices can go up, and crowds are much more significant at famous sights. What to pack: Temperatures in China can drop rapidly in the fall, so pack accordingly with layers such as knit sweaters, long-sleeves T-shirts, and long pants or jeans. In colder areas like Harbin, you'll want to bring winter accessories, including a scarf, gloves, and a hat.